Please join us in a celebration of art and the creative spirit as we gather talent for our 3rd annual benefit art show, Power in Numbers 3! 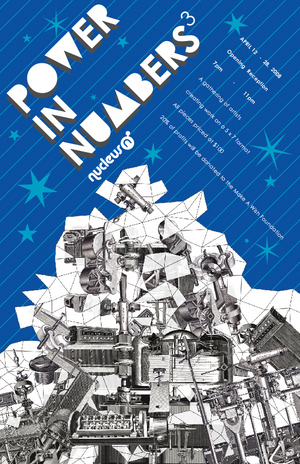 Our biggest event of the year, Power in Numbers features artists creating 5" x 7" postcard-size artwork in any desired medium and themes of their choice. All works will be priced at $100.00 and 20% of profits will go towards a benefit of choice. This year’s benefit of choice is the Make-A-Wish Foundation® of Greater Los Angeles. This show will also mark our official homecoming party into our new space so join us opening night for the festivities! 1. Attendees will be given a ticket with a number at the door starting at 6pm. The first 50 will be allowed into the gallery at 7pm. Afterward we will be allowing one person in for each person leaving. Those waiting to get in the gallery can wait in the store until your number is called in sequence. 2. After entering the gallery, browse until you have decided on your purchases, take a pen and write your ticket number underneath the piece on the label: "sold to____". Each person can mark up to 5 pieces. Mark only the pieces you will buy and pay for the artwork immediately after you mark your label. 3. You may pay for your artwork in cash or credit. We will record your name, and contact info, and the piece you purchased on a list for record keeping purposes. 4. Buyers may pick up their purchases when the show ends (April 28). We will also call buyers for pickup after the work is taken down. No artwork will be released without full payment. If you want to purchase a piece come early to reserve your number. We start handing out numbers in the store at 6pm the gallery opens at 7pm.